The hospital says an employee tested positive for TB in October. 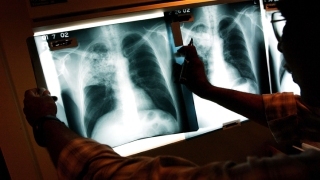 A doctor examines the x-rays of a tuberculosis patient in this file photo. More than 170 veterans are being screened for tuberculosis after an employee at the Veterans Affairs medical center in Palo Alto was diagnosed with the disease but continued to work for months. Congressman Jerry McNerney says the employee tested positive for TB in October, but management didn't find out until last month. The hospital disputes that claim, telling NBC Bay Area the employee tested positive in January and has not returned to work. The VA so far tested more than 60 percent of the veterans who could have been exposed. All of the results are negative. Spokesman Damian McGee said the VA is continuing to reach out to the veterans who have not responded.